The Gin Blossoms brought their version of 90s alternative rock to Spirit Mountain Casino in Grand Ronde, OR on Saturday without a lot of fanfare but with a whole lot of fun. 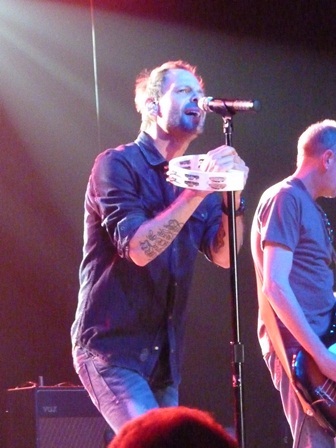 In perhaps one of the biggest venues the band has head-lined in recent memory (their last stop to the Portland-area was in Albany at the Linn County Fair) the Gin Blossoms eloquently played a 16-song set that featured six from their latest album No Chocolate Cake – now already two years old. Lead singer Robin Wilson, blessed with perhaps the most emotive tone in pop rock today, guitarists Jesse Valenzuela and Scott Johnson and bassist Bill Leen, do things quite casually, meandering on-stage with no introduction, but what the band lacks in showmanship Wilson certainly makes up for in stage presence. Fans are now so accustomed to Wilson’s antics some bring their own tambourines in hopes of being called out to play along with the band. Those without them Wilson graciously provides the extras and passed them out as he saw fit. Alas there was no shortage of high-fives given cheerfully by Wilson and a number of people were either sung to via phone or now have part of a Gin Blossom’s song on their voice mail. The Gin Blossom’s started things off with Chocolate’s “Don’t Change for Me” and then “Lost Horizons” the first track from their smash album New Miserable Experience and continued with “Miss Disarray” probably their biggest hit from No Chocolate Cake. “Somewhere Tonight,” “Dead or Alive on the 405,” “I’m Ready” and “Wave Bye Bye” rounded out the songs from their latest album. No Chocolate Cake (2010) felt, at the time, like a sophomore album after the fantastic Major Lodge Victory which came out in 2006. There are some solid songs on Chocolate but it didn’t quite live up to Major Lodge (their first studio release in 10 years at the time) which in some ways redefined the band and felt like a successful first album. However, the live songs from Chocolate were surprisingly strong and revealed the strength of the album. “I’m Ready” was one of the best songs of the night and showcased the band’s ability to jam. Both Valenzuela and Johnson took turns taking lead and soloing and their deftness at their craft has never been stronger. 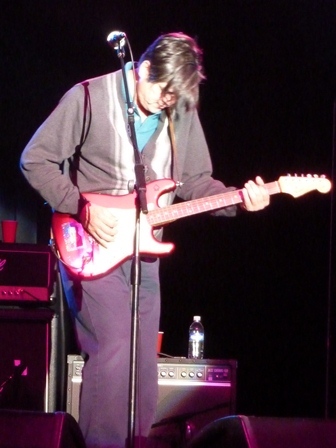 Valenzuela performed a beautiful extended solo during “Learning the Hard Way” and Johnson did likewise on “Til I hear it From You.” Give it up for Leen who typically hovers in the background but didn’t let Wilson take all the spotlights as he thumped around up front – and even smiled a couple of times. Of course, a Gin Blossoms concert would not be complete without fan favorites “Found Out About You” and “Hey Jealousy” which Wilson did not really need to sing as the audience took over most of the vocal duties. “Until I Fall Away” didn’t really measure up to the album version and was the only low-point of the evening. For purists the band’s core members are still intact from their hey-day which gives them an element of authenticity and, in today’s short-lived music world, relevancy. (They’ve been recycling drummers since they reunited.) They broke up shortly after releasing Congratulations, I’m Sorry in 1996 but reunited in 2002 and have been more or less touring ever since while releasing two albums. However, it seems as though they are unwilling to take it to the next level which can be easily done by stepping up the show’s production. Wilson looked like he had just woken up and Leen looked like he just got back from running errands. They don’t even have a merchandise table which is unheard of in today’s music scene. Regardless, the music is there and fans can expect more of the same for some time to come if Valenzuela gets his way. In an interview earlier this year, he indicated a desire to move away from recording full albums and instead release singles for movies or TV and he’d be happy to continue touring for 20 more years.